Whenever I am travelling somewhere in a small plane, I always keep a camera handy in case there are photo opportunities to be had from the air. 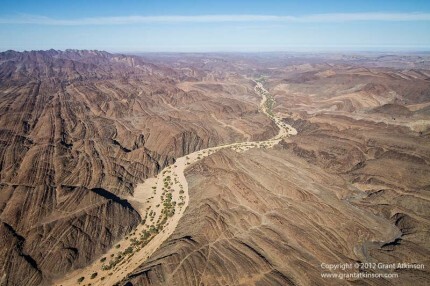 Although hiring a plane just for photography is perhaps the best way to get good pictures from the air, this doesn’t mean that you cannot get good images on regular transfer flights, and of course, this doesn’t cost you any extra money! In this text I share some practical suggestions that might help to make the more casual approach a little more effective. I seem to get my best results when shooting at focal lengths anywhere between about 16mm on the wide end, and perhaps 100mm on the long end of the focal length range. This means that wide-angle zoom lenses like the Canon EF 16-35L f/2.8, the EF 24-105L f/4.0 is, and the Tokina AT-X 16-28 f/2.8 are good choices for this type of photography. The ability to change focal length quickly is important. Compact cameras also work well, if used properly. Shooting with wider focal lengths mean that I am always looking to include strong shapes and textures into my composition. 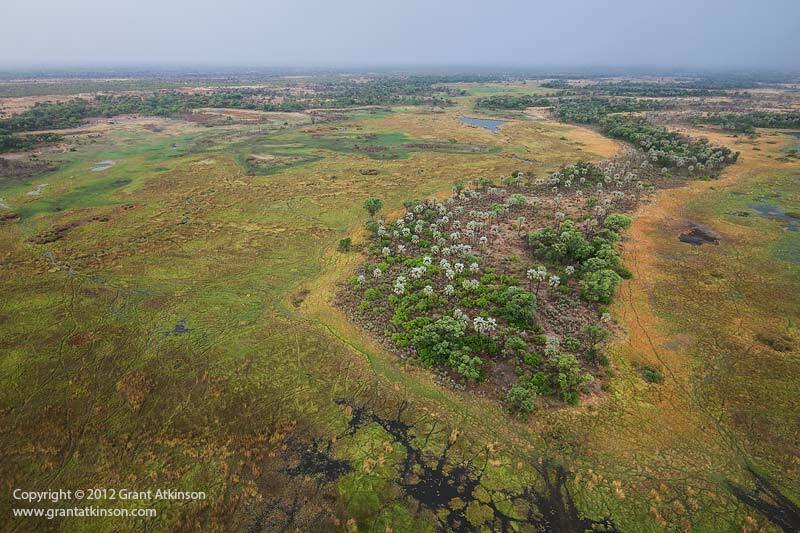 In this image of the Okavango Delta, the strongly curving shape of the tree island caught my attention, as did the bright leaves of the fan palm trees. The picture was taken just moments after a rainstorm had swept through, and the colours of the earth and vegetation were richer for the rain. It is also important to shoot at fast shutter speeds, to stop vibration from the aircraft from causing blur in your shots, and to freeze your own motion in the moving aircraft. I try to keep speeds upward of 1/1600sec, and below 1/3200sec when the light allows. I also shoot images like this with my camera’s focus mode set to Ai Servo which is for moving subjects, or in this case, a moving photographer. On Nikon and Sony cameras that equivalent setting is called AF-C (Continuous). Being so high up, and far from your focal point, which is usually the ground, means that you don’t need to close down your aperture for too much depth of field, and apertures ranging from wide-open at f/2.8 ranging up to about f/6.3 work well enough for me. 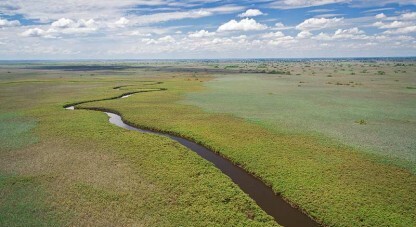 Okavango Delta from above. Canon 350D, Canon 17-85mm lens. Shutter speed 1/800sec at f/5.0, Iso 400. A challenge that can make it a little difficult to take good images from the air are the reflections caused by windows in the aircraft. Look carefully for these reflections when composing in your viewfinder or rear screen, as they can easily ruin an image if you don’t take note of them at the time. Sometimes just changing the angle of the lens slightly can reduce them or move them to a less important place in the image. I also always remove the lens hoods and filters from my lens for this type of shooting, so that I can get the lens as close as possible to the aircraft window, which helps with minimizing reflections. Try to choose your seat in the aircraft so that you have the clearest view out of the window. Looking ahead for possible framing opportunities is also helpful, as does pre-focusing your lens on the ground. The ground below usually passes by pretty quickly, and any extra lead time you can create for yourself will be helpful. If the air is dusty or hazy, or the plane flying very high, it can be very hard to take good pictures. However, there are often opportunities to be had just after take-off, and again, just before landing, when the lower altitude minimises how much air you have to shoot through. If you have the time, make sure the window is clean before you take to the air, that can save you having to deal with misty spots on your image afterwards. Photographing from the air can be rewarding, and a good way to take advantage of unexpected opportunities. 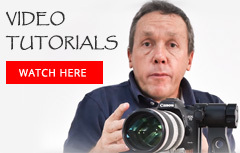 Stunning shots and great advice, Grant. An advice I can use Grant. Thank you! 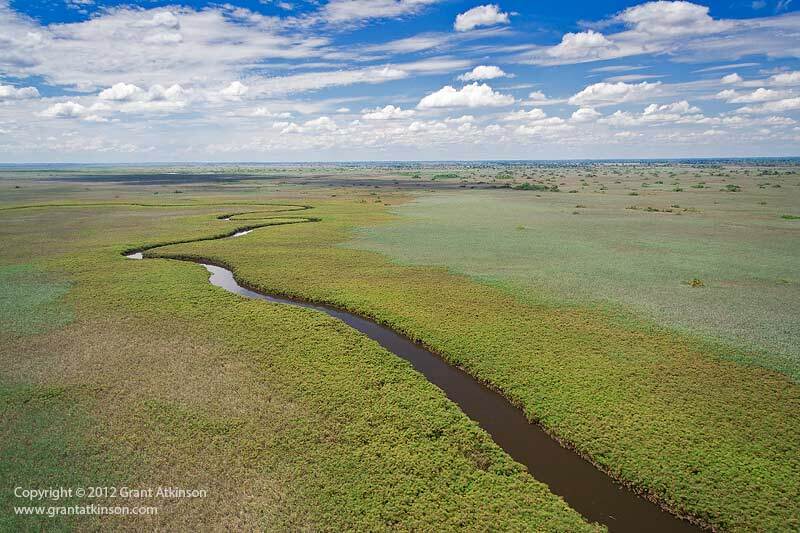 One of the first times I went to Botswana I booked a one hour scenic flight over the Okavango in one of those Piper Cup- like little airplanes that flew much too high and dived way too fast. 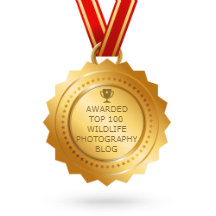 I was totally inexperienced with this so I believed it was possible to photograph animals from above. No way Fred! The pilot told me to stick the lense out of the window (that was really dirty) that could open a few inches, stuck out the lense and the wind was so strong the lense was screwed reverse out of the camera. Before I found out what lense to use and adjust myself in the seat the flight was over. A lesson learned for 200 USD. Would be nice ballooning over the Okavango, but it’s too dangerous and thus not allowed. Helicopters I think are really disturbing for wildlife and people that watch them on the ground. For sure some of the air charter companies may have pilots that don’t really understand what will help a photographer, as you describe, Fred. Also, I really prefer to look for landscape opportunities over trying to photograph animals from the air. I dislike seeing images from the air of running animals that have been scared by aircraft or helicopters flying too low just for a photograph. 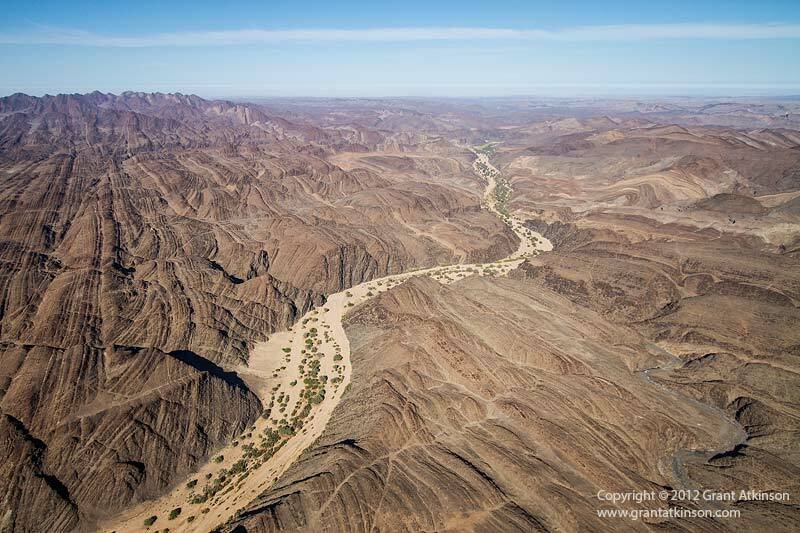 For me, aerial photography is about landscapes. If you do get a herd of elephant, or giraffe in the distance, and they can be included without approaching closely, that is a bonus. Thanks for sharing your experience here Fred..